Today, Nigerian seaports are rated as one of the most expensive to do business in the entire West African region, judging by the fact that imported cargoes, especially containerised ones, stay longer days in port terminals before importers can obtain the needed authorisation to move the containers to their warehouses. As a result, importers using seaports in Nigeria pay more as demurrage charges to shipping companies and storage charges to terminal owners for not taking delivery of their consignments as and when due. The existence of these challenging factors is not down to increased volume of goods at the ports, but can be attributed to gross inefficiency in the system, especially on the part of government agencies, including Customs. Nigerian Ports Statistics, as released by the National Bureau of Statistics (NBS), reflected that ship traffic at the Nigerian ports recorded a total of 4,175 ocean going vessels with 131,569,821 gross registered tonnage in 2017, as against 4,622 ocean going vessels with 134,2,13,076 gross registered tonnage in 2016. Similarly, a total of 12,243 service boats with 5, 910,406 gross registered tonnage was recorded in 2017 as against 9,418 service boats, with 5,193,402 gross registered tonnage in 2016. Also, cargo traffic statistics revealed a total of 71,903,266 metric tonnes of cargo were recorded at all Nigerian ports in 2017 as against 70,819,092 metric tonnes recorded in 2016. The above mentioned challenges were as a result of the various hiccups that come with doing business in Nigerian ports. The hiccups make it more time consuming, cumbersome and expensive for an importer to bring in consignment through the port. A report by the Lagos Chamber of Commerce and Industry (LCCI) and the Financial Derivatives Company published in 2016, estimated that importers pay as much N1 trillion in cost annually to delays caused by use of cumbersome paper work in cargo clearance and inefficient port system. 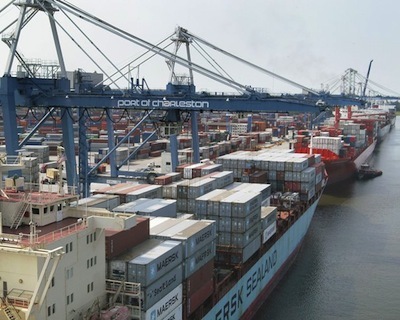 Similarly, the Nigerian Shippers Council (NSC) in 2017 released a report that stated that the nation’s ports have the longest cargo dwell time of 19-25 days, compared to other ports in the world. The report stated that cargo clearance timeline takes longer days, against the ideal period of two to seven days it takes in Cotonou port; Durban port, South Africa or Mombassa port. However, BusinessDay recent research shows that the situation has gone from bad to worse as cargoes now dwell between one and two months (30-60 days) in the ports. This can be blamed on delays experienced by importers and their agents during cargo clearing at ports. For instance, all the imported containers in Nigerian ports are now subjected to 100 percent physical examination by the officers of the Nigeria Customs Service (NCS) due to non-utilisation and the faulty state of the multi-billion naira scanners installed at the various port terminals and border stations. Also, Customs documentation and clearance processes have remained the same and largely manual coupled with existence of multiple government agencies that delay cargo clearance at the ports. In addition to this, entrance into the port has become very challenging to not only importers but to also service providers due to persistent traffic gridlock on port roads. This poses serious threat to smooth movement of goods, and it also increases cost of doing business, as importers experience man-hour losses because Customs and other service providers always report and commence examination late due to the traffic situation. For these reasons, Nigerian importers prefer ports in the neighbouring countries of Benin Republic and Togo where it is faster and cheaper to clear cargo from the port. Reducing delays in Nigerian port is not a rocket science as Customs can reduce dwell time to two days (48 hours) through effective utilisation of automated clearing system such as scanners, which has the capacity to fast-track cargo clearance at the ports. Customs officers and all other service providers that work from 9am to 5pm need to put mechanism in place to be available 24/7 in order to attend to importers and their agents, and they can achieve this by running 12-hourly shift on daily basis, experts say. If port service providers operate 24/7, Nigerian seaports would become user-friendly, more efficient and the dwell time of cargo would reduce. This will also ensure faster turnaround time for ships calling the ports. But, for 24-hour operation to work, the government must improve on the security system within and around the port by ensuring that port access roads are well illuminated and that security cameras are installed to monitor movement of persons and cargoes in and out of the ports. Security officials such as men of the Nigerian Police Force and others must always be on ground to monitor activities around the ports. Also, Nigerian government needs to bring all the units of Customs, agencies and service providers in the port under one umbrella to enable them conduct cargo examination together without delay. Therefore, there is a need to do away with multiple divisions of Customs and agencies like Standards Organisation of Nigeria (SON), National Agency for Food and Drug Administration and Control (NAFDAC), as they should be moved out of the port. This is because multiplicity of agencies creates avenue for corruption to take place. Therefore, if the incoming government can overhaul the system of cargo clearance at ports, it will help to develop the economy.